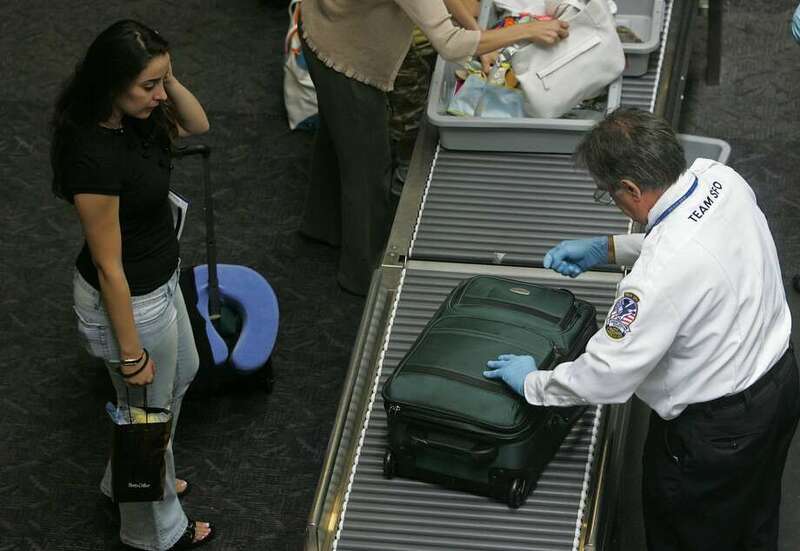 FILE – A TSA employee searches the luggage of a United Airlines passenger at a security checkpoint at San Francisco International Airport on Aug. 10, 2006. TSA officers are required to report any suspected violations of law, including possession of marijuana and cannabis infused products. While they don’t search for marijuana or other illegal drugs, in the event they find an illegal substance, they will refer the matter to a police officer to enforce state law. What will TSA actually do with your weed if you’re traveling between two states where it’s legal? Is it legal to bring marijuana on a plane from one state to another if it’s considered legal in both states? Most websites’ answers were a resounding, seemingly obvious “no.” Go ahead, laugh at my naivety all you want. But after spending most of my life in the Midwest where recreational marijuana legalization seemed to be a far-off pipe dream, I honestly didn’t have a clue. Nor did I think it was a question I would ever have the opportunity to ask. Sure, I knew I could just buy whatever I wanted when I arrived in Portland, but after spending money on plane tickets, a few nights’ stay in a hostel, and knowing I had other pending expenses ahead, I didn’t want to drop even more cash on something I already had – legally. So, I went the safe route and left my edible gummies I was planning on bringing at my apartment and begrudgingly purchased more when I got to Portland. Still, I knew I wasn’t the only one questioning this legality. Whether you’re traveling to Portland like I was, or other big cities where recreational marijuana is legal – say, Seattle, Denver, Las Vegas, or Boston – it seems contradictory to have to leave your cannabis products at home when the law is giving you the green light in both your own city and destination. That’s not to mention medical patients who need certain strains in order to combat chronic pain or alleviate symptoms of an illness. It was simple for me to just leave my weed at home, but what about patients for whom stopping usage can be detrimental to their health and well-being? Long after I returned from the trip, I had the answer to my question, but still wanted the details. Are CBD products okay at airports? Is a TSA dog really going to sniff me out? Jenny L. Burke from the Transportation Security Administration provided me with some answers that might help you on your next journey. As soon as you head into that airport, marijuana is considered a controlled substance and is therefore illegal from a federal perspective. So, carrying a joint through the TSA checkpoint at a California airport is illegal? Yes – but that doesn’t mean you’ll necessarily get in trouble if you get caught. TSA says that officers are required to report “any suspected violations of law, including possession of marijuana and cannabis infused products.” That being said, your weed likely isn’t their priority – the safety of everyone else is. TSA’s screening procedures are security-focused and designed to look for “potential threats” to aviation and passengers. What about my CBD oil that I use for pain relief? Yup, still illegal according to TSA guidelines. Again, they’re not looking for it though. What if I just kept my marijuana or CBD-infused products in my checked luggage? This is also illegal in the eyes of the (federal) law which governs airports, and you don’t want to mess with the random searches that TSA conducts. Still, the searches there prioritize heavy metal objects and bottles full of liquid – frequent suspicious objects that call for further inspection, again, for security reasons. Do TSA dogs sniff for weed? No. While some people think airport sniffer dogs will seek out illegal drugs, they’re predominantly trained to sniff for explosives, and to sniff for things that could introduce an invasive species into a foreign ecosystem. There’s more to it, though. Some dogs are trained to sniff for many drugs, but recent state court rulings on marijuana mean their keen noses for pot are no longer needed. They would return false positives on their work sniffing for other (illegal) drugs. They can’t always be counted on to smell the right thing, and some are actually being eased out of the labor force because of this. TSA officers are required to report any suspected violations of law, including possession of marijuana and cannabis infused products. While they don’t search for marijuana or other illegal drugs, in the event they find an illegal substance, they will refer the matter to a police officer to enforce state law. So, if you’re in a state where cannabis is legal, local officers are not likely to do anything, even as federal possession laws apply – as long as you don’t have eight pounds of weed chocolate. It’s up to you to decide whether to play it safe or be a little daring, but you’re likely under less scrutiny than you might have previously perceived. Safe travels! This story was originally published on GreenState. CBD oil for STRESS & ANXIETY.. Is it worth it??? Q&A: CBD Oil Protocol for Insomnia? Copyright © 2019 https://linksthesun.com | All Rights Reserved.